April was the month where we had to stomach as much fish as possible so as to last us till August (as if we were camels!!). ‘No fish from May to August’ is what my mom’s friend (who used to make fish everyday!) used to say. We continue to follow that practice even today. (oh.. it just rhymed!) I cooked fish almost every weekend through April-this one is a seer fish (surmai) fry, made when my cousin had come over for lunch with my aunt and my nephew. Fresh fish, cleaned, cut into thin slices, cleaned again, marinated and fried. Delish! Making this was even more fun as my 3 year old nephew, Jio, was helping me wash the fish and ensure that every single piece was super clean. He is very finicky about such things! Tawa fish fry is a very commonly made fish in Coastal Maharashtra. It usually involves marinating the fish in a bit of turmeric, red chilli powder, lemon juice, salt and some garlic; coating it with rice flour (with some fine semolina added to it) and then frying it on a pan/griddle. Somehow, my mom never used red chilli powder, as according to her- ‘the red chilli powder burns as you fry the fish and does not make the fish as spicy hot as you would want it to be’. I have to agree with her. Although, I do make the red chilli powder version when I don’t want my hands to burn from handling minced green chillies! When making tawa fry fish, make sure that you take steaks of fleshy fish like seer, kingfish, pomfret or indian salmon. Thinner the steak/slice, crisper the fish will be. If you like your fish to be chunky soft, then opt for thicker (0.5 to 1 inch thick) slices. This is a good appetizer as it can be kept ready marinated in the fridge for a few hours and you can turn out a large batch at one go provided you have a large griddle/pan. Fish is delicate business- make sure that you are gentle with it when trying to coat with piece with the masala. Cooking fish on a medium flame makes the outside crisp and the inside tender but well cooked. And hey! how can we forget the good protein, omega 3 fatty acids advantage? Time to get fishy! – Grind the chillies, garlic and ginger to a coarse paste by adding some salt to it. – Clean, wash and drain out the fish pieces. Add the chilli ginger garlic paste to the fish. Then add the turmeric and a dash of lemon juice (1 tsp). Apply this mix to the fish pieces, ensure that the masala is applied to both the sides of the fish. – Leave aside for 30 mins. – In a plate, mix the semolina and flour and add some salt to it to taste. – Coat the marinated fish with this flour mixture. – Heat one tbsp oil on a non-stick pan/tawa and then add the coated fish to it. Cook on both sides till crisp and golden. -Serve hot with a wedge of lemon and sliced onion. 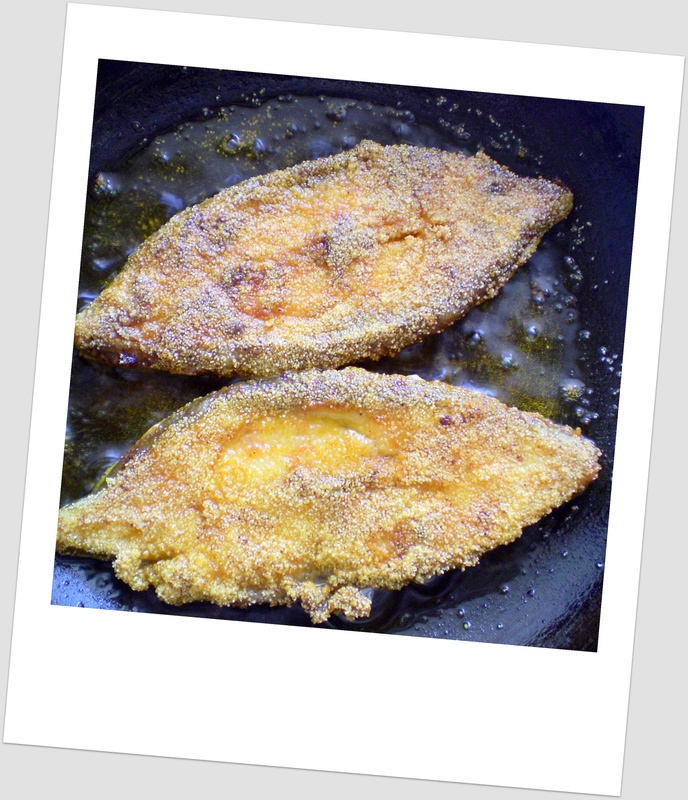 This entry was posted in Healthy Recipes and tagged fish, griddle fried fish, healthy fish fry, malvani fish fry, pomfret fry, surmai fry, tawa fish fry. Bookmark the permalink.